What happens when your customers try to buy from you? If you are the same as your competitors, then why will anyone bother to buy from you? So, how do you separate yourself from the ‘rest of the crowd’? It will help you to become better than the competition and build stronger customer relationships. Robert Craven is a business speaker and consultant. He shows younger businesses	how to grow and makes larger businesses	more nimble. Running The Directors’ Centre, he is Visiting Professor, Toulouse Business	School and Associate Fellow, Warwick Business School. His previous book, ‘Kick-Start Your Business’ was described as ‘truly inspirational’ and placed in the Top 10 Business Books by The Independent. Creating 'Customer-Pull' - Buzz, Buzz, Buzz! 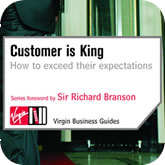 If Customer Experience Is Everything Then What Is It? The Essential Laws Of Customer-Focused Marketing. do not accept pale imitations! 'Customer Is King', 'Kick-Start Your Business' and 'Bright Marketing' and their contents are copyright (©)materials. We defend our copyright and our intellectual property. Only materials sold and delivered through The Directors' Centre Ltd and using these names are the original items. Others consultants using our materials without permission are infringing our copyright. Others adopting our approach and using similar materials are considered to be 'passing off' materials as their own. These rights have been asserted under the Coyrights, Designs and Patents Act, 1988. Legal representatives of Virgin Publishing and The Directors' Centre will defend our intellectual property rights. You have been warned!